Over the years, we have been involved in a variety of group processes, both online and offline. Obsidian has also designed and developed a number of Internet-based, data and information collection systems -- ranging from simple journalling systems to more complex United Way Funded Agency Annual Reporting Systems. During the course of those development activities, Obsidian has developed a number of administrative modules that support the various data/information collection processes -- including (but not limited to) participant invitation modules; internal messaging modules; help system modules; participant management modules; and aggregating/reporting modules. Late last year, we were exposed to book, 'Research Integration Using Dialogue Methods' (from Australian National University's Integration & Implementation Sciences Department [I2S]), displayed on the left. As we read and explored the various dialogue approaches outlined in the book (and revisited some of the materials from the New Jersey Institute of Technology), we recognized an opportunity to develop a support system for at least some of the methods outlined. We also recognized that the use of dialogic processes extends beyond Research Integration, but that this emerging discipline provides an interesting framework for our proposed development efforts. This website is intended to be a repository of information regarding different dialogic techniques and to be the developmental home of our dialogue support system. Use the navigational menu above to explore the different parts of our site; feel free to contact us with any questions or requests. 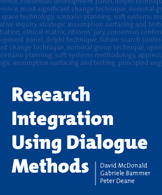 McDonald, Bammer & Deane (2009) Research Integration Using Dialogue Methods. Copyright © 2013,2014 Obsidian Communications All Rights Reserved.